I Hereby send my design proposal for the Pastoor Joorenplein, in Bergen op Zoom. 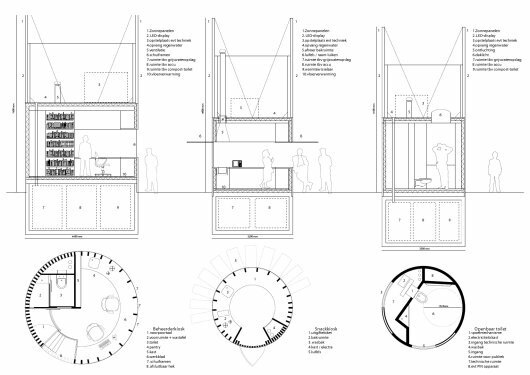 The design consisting of a series of self sufficient, sustainable kiosks. The system is inspired by the working method of JCDecaux: they offer municipalities street furniture, like bus stops, billboards and kiosks, for free and take care of the maintenance and reparation. In exchange, they keep the rights to exploit the commercial billboards that come incorporated in the street furniture. I propose to finance the kiosks on the Pastoor Joorenplein in a similar manner: with the money generated by the LED screen, broadcasting advertisement, it will be possible to build the kiosks and to assure their maintenance in the future. This can be done by the municipality of Bergen op Zoom or in collaboration with JCDecaux. The kiosks not only generate money, but they also produce the energy and water needed for their own functioning; they are self-sufficient. -The solar panels on the top power the LED screens and the interior of the kiosk. Besides electricity these solar panels provide heating by means of hot water running in the floor (in summer this can be reversed to cool the kiosk). -To flush the toilets, in the kiosk and the public toilet, rainwater can be used. -In the evening the kiosks illuminate the square (with the solar power harvested in the day) to improve the safety and attractiveness of the square. The LED screens can be used in a more flexible way than billboards and posters, the broadcasted pictures can changes as often as one wants. It makes it possible to easily switch between local and international news, between commercial advertisement and art. For example, the screens can be programmed to show 90% commercial messages and 10% art. My goal is to develop sustainable street furniture, that can improve the urban environment without becoming a burden on the city. Different options for using the LED screens. Sections and plans of the different elements.